Omar Oil Field (Syria) (AFP) - US-backed forces were locked in fierce fighting Sunday as they pressed the battle against the last shred of the Islamic State group's "caliphate" in eastern Syria. 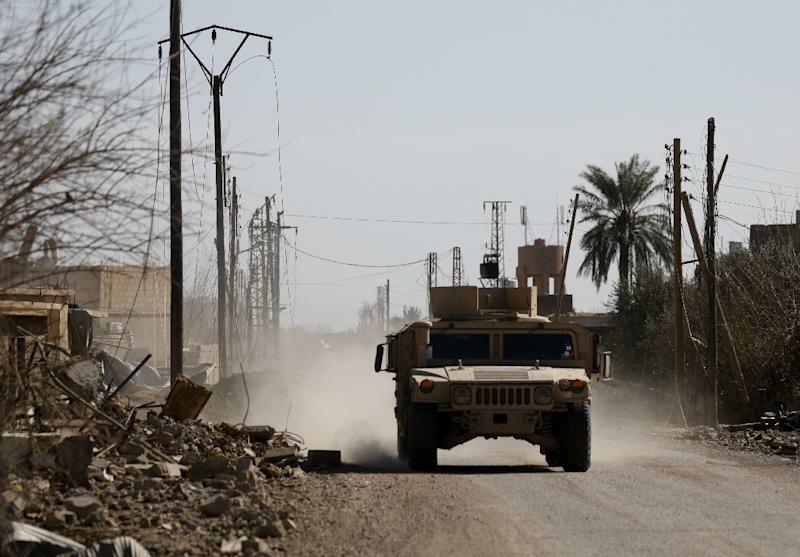 The jihadists overran large parts of the country and neighbouring Iraq in 2014, but various military offensives have since reduced that territory to a patch on the Iraqi border. SDF spokesman Mustafa Bali on Sunday afternoon said his fighters had battled their way forwards against the jihadists, capturing 41 positions from them. "Our forces are relying on direct combat with light weapons," he told AFP. The Syrian Observatory for Human Rights monitor group said the SDF had advanced across farming land, backed by coalition air strikes and artillery fire. Earlier, an SDF field commander reported "heavy clashes" as his fighters gained ground. 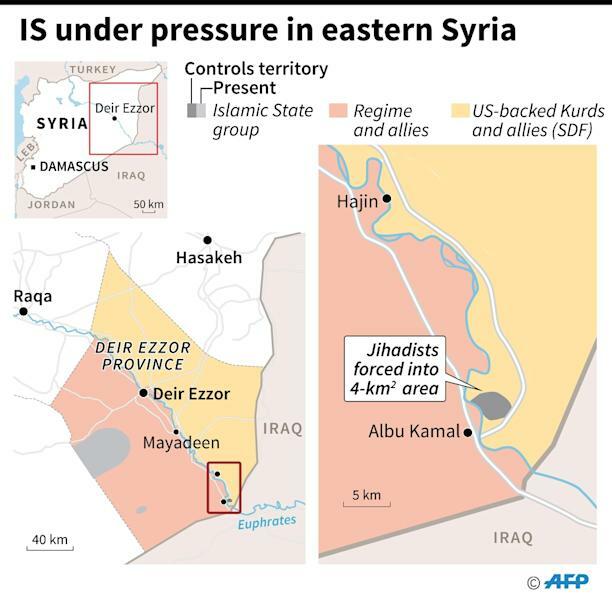 The SDF launched an offensive to expel IS from the oil-rich eastern province of Deir Ezzor in September. Up to 600 jihadists could still remain inside, most of them foreigners, Bali said. Hundreds of civilians are also believed to be inside, he said. "We do not think he is in Syria," Bali said, without adding further details about the whereabouts of the man who declared a cross-border IS "caliphate" in 2014. 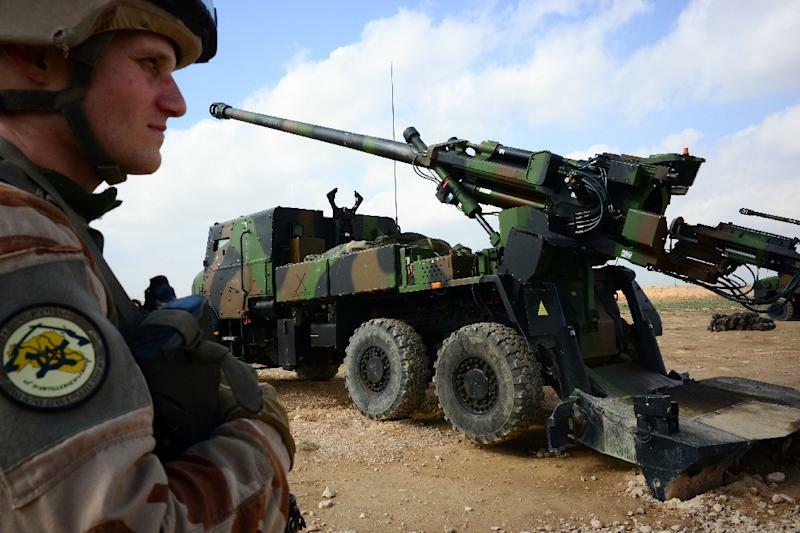 On the Iraqi side of the border, French members of the coalition on Saturday stood ready to pour fury on any jihadists trying to escape. Dozens of 155-mm shells were lined up ready to be loaded onto three green-and-black Caesar gun-howitzers with a range of 40 kilometres (25 miles). Coalition deputy commander Christopher Ghika last week said Iraqi forces had sealed their border with Syria. Since September, more than 1,270 IS militants, more than 670 SDF fighters, and around 400 civilians have been killed in the fighting, the Observatory says. At the height of their rule, the jihadists imposed their brutal interpretation of Islamic law on a territory roughly the size of Britain. But military offensives in both countries, including by the SDF, have since retaken the vast bulk of that "caliphate". On Saturday, Bali said he expected the battle for the last patch of IS territory to be over in days. The jihadists however retain a presence in Syria's vast Badia desert, and have claimed a series of deadly attacks in SDF-held areas. Since December, more than 37,000 people, mostly wives and children of jihadist fighters, have fled out into SDF-held areas, the Observatory says. That figure includes some 3,400 suspected jihadists detained by the SDF, according to the monitor, which relies on sources inside Syria for its information. The SDF holds hundreds of foreigners accused of belonging to the extremist group in its custody, as well as members of their families. They have urged Western governments to repatriate their nationals, but politicians abroad have been reluctant. Relatives at home fear alleged foreign jihadists may end up facing tough justice in Iraq, where Human Rights Watch warned they could face "torture and unfair trials". On Sunday, a Russian diplomatic source says Russia was repatriating 27 children who mothers are being held in Iraq for belonging to IS. The issue of jihadist repatriation from Syria has come into sharper focus since the United States in December announced its military withdrawal from Syria. That announcement has seen the Kurds warn they may struggle to keep jihadists in jail, and pushed them to seek a new ally in the Damascus regime to prevent a long threatened Turkish offensive. While the Kurdish People's Protection Units (YPG) have been a key US ally in the fight against IS, Ankara views them as "terrorists". Syria's Kurds have largely stayed out of the country's civil war, instead building semi-autonomous institutions in northern and northeastern regions they control. The conflict has killed more than 360,000 people and displaced millions since starting in 2011 with a brutal crackdown on anti-government protests. The regime has made a military comeback with Russian military support since 2015, and now holds almost two-thirds of Syria.